The WHAS telethon benefits a wide range of children’s charities throughout Kentucky and Southern Indiana. The Crusade began in 1954, and since its founding, the Crusade has raised more than $138 million for local children’s special needs. 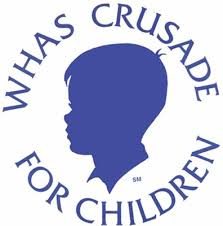 Throughout the year, various agencies throughout Kentucky and Southern Indiana apply for grants from the Crusade. Grants are made in all 120 Kentucky counties and in 50 Indiana counties. The Crusade returns donations from a certain area to that area — for instance, donations from Floyd County, IN will be assigned to grant requests from that county. This has been Crusade policy since the beginning. All grants are on an annual basis; thus, charities must reapply each year. Grant requests typically total about three times the amount collected. The Crusade prides itself in the fact that 100% of all donations go directly to grants. All overhead costs of the Crusade organization are covered by donations from businesses, and more recently from proceeds of an endowment set up for that purpose. During the years of Bingham family ownership of WHAS, the stations and the family covered many of such costs. Please give generously when the mission buckets are passed or you may use the envelopes on the back of the pews.